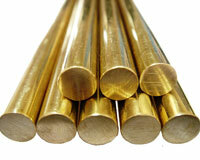 Brass is the generic term for a range of copper-zinc alloys with differing combinations of properties, including strength, machinability, ductility, wear-resistance, hardness, color, antimicrobial, electrical and thermal conductivity, and corrosion-resistance. Brasses set the standard by which the machinability of other materials is judged and are also available in a very wide variety of product forms and sizes to allow minimum machining to finished dimensions. Brass does not become brittle at low temperatures like mild steel. Brass also has excellent thermal conductivity making it a first choice for heat exchangers (radiators). Its electrical conductivity ranges from 23 to 44% that of pure copper. Moreover, Admiralty brass, which constitutes of 30% zinc and 1% tin & inhibits dezincification in most environments, is extensively used material in manufacturing tubes for the transportation of liquids in the coolers and evaporators. Few of the characteristics that is required by this industry includes; high thermal conductivity, light weight, strength, corrosion-resistance tube, long lastingness & durability.